On September 5, 1912, Franklin Rosborough Thomas was born in Fresno, California. Thomas knew from an early age that he wanted to be an artist, and in his sophomore year at Fresno State, his interest expanded into animated films. After graduating from Stanford University, he honed his craft at the Chouinard Art Institute in Los Angeles. After being told by a member of his rooming house that the Disney Studios had an opening, Thomas applied and joined on September 24, 1934 as employee number 224. His first assignment was the animated short film Mickey’s Elephant. In 1941, Thomas was picked to be part of a small goodwill tour of South America, which culminated in the animated feature films Saludos Amigos and The Three Caballeros. As a member of the Nine Old Men, Thomas served as a directing animator for several characters, as well as being well regarded for several of his animated sequences, including the dwarfs crying over Snow White’s body, and Bambi and Thumper’s ice skating scene. Thomas was also the pianist for the famed Disney Dixieland band Firehouse Five Plus Two. 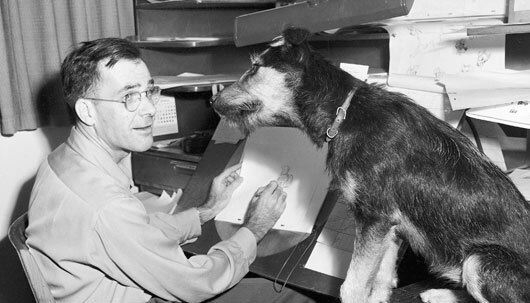 In 1978, Thomas retired from the Disney Studios, but still remained involved in the field of animation, co-writing several books with colleague and long-time friend Ollie Johnston, including one of the most important books in the study of animation: Disney Animation: The Illusion of Life. He, along with other members of the Nine Old Men, were honored as Disney Legends in 1989. In 2004, Thomas passed away at the age of 92. Posted in Uncategorized and tagged Animated Feature Film, Animator, Births, Disney Legend, Nine Old Men. Bookmark the permalink.